Follow a chocoholic as she attempts to live a happy and healthy life. So one day at work I was procrastinating and checking my email, when a recipe for a healthy alternative to Mac and Cheese popped up. Intrigued, I clicked on the link and sure enough, yumness popped up. I loooooooooove mac and cheese. The incredibly unhealthy Kraft kind. Mmmmm... yellow cheese powder. Of course Overweight Chocoholics attempting not to look like Miss Piggy in a wedding dress has banned the Cheesiest from her wedding dress diet. Seeing the blue box sitting on those grocery shop shelves brings a single tear to my eye. 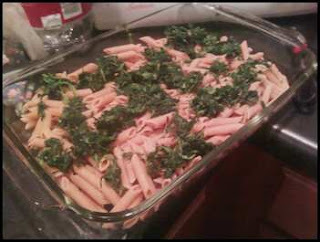 The recipe I found with its whole grain pasta and spinach has a lot more umpf than the kiddy Kraft kind, but the goodness is too much to pass up. Looking at the recipe, I decided to make some changes and turn it from a side dish into a yummy baked casserole able to be eaten over multiple days. As yum as this recipe seemed, I decided to make some changes to slim it down and make it a whole meal instead of a side dish. For the pasta, I chose to use whole-grain penne pasta and cooked enough to fill a shallow casserole dish. Since the dish was shallow, instead of layering the spinach, I chose to mix it in with the pasta and cheese sauce. Instead of using plain breadcrumbs, I choose to use panko style breadcrumbs for its superlicious crunchy taste. Since I used a larger casserole dish, I need more than three table spoons. 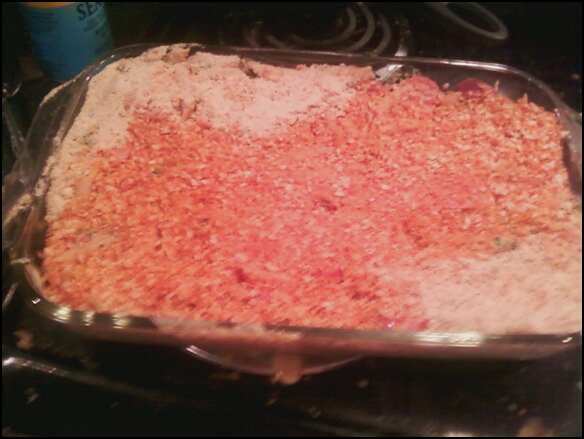 The oil was still more than enough and lightly coated all of the breadcrumbs. 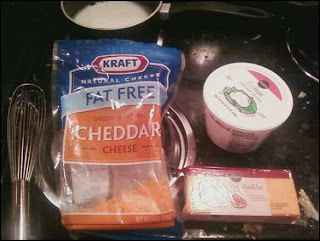 I also used 1% milk (it was what we had), whole wheat flour, fat-free cottage cheese, and mixed a cup of fat free cheddar with the extra sharp cheddar. 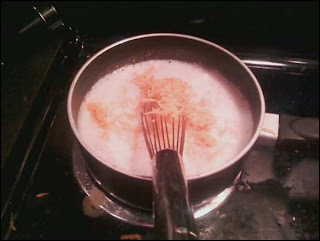 When mixing the cheese, in addition to the nutmeg, I also added a teaspoon of garlic powder and a teaspoon of paprika to give the cheese a little extra flavor. I also substituted a pinch of seasalt instead of regular salt. Once the pasta was mixed with the cheese sauce, and spinach, I added the breadcrumb layer and popped it in the oven to cook and bubble for a yummy dinner for Dave and me. Oh my god. This thing was unbelievable. We actually ate this dish for 3 days without any complaints, and were sad when it was gone. Perfect comfort food without the powder cheese! This meal will be added into the rotation. According to the original recipe, a serving of this casserole was around 500 calories. Give and take my fatfree changes, it is a hearty meal. The best part is I didn't have to eat a lot to feel full and energized for the whole day. This was definitely my kind of meal! I vent for your amusement. Hopefully it can be inspirational. Follow me on Twitter: @Sassy_redhead81. I'm pretty new to Twitter (quit rolling your eyes, you youngins! ), but I'll eventually figure it out! Better 2 years late than never! You are so smart…why did you become a teacher?